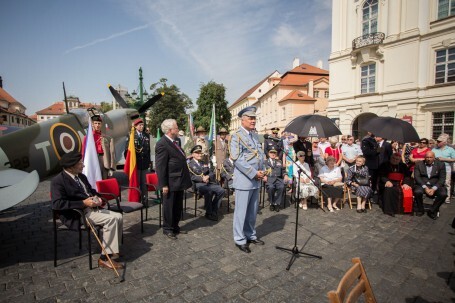 Prague, 14th August 2015: Today in the presence of distinguished guests and the general public a grand ceremony in Hradčanské náměstí celebrated the 70th anniversary of the return home of the Czechoslovak airmen who escaped Nazi oppression, made their way to the United Kingdom to join the Royal Air Force, and fought with the RAF to secure the restoration of Europe’s freedom. On the occasion a life-sized replica Spitfire Mk. IX was showcased in front of Prague Castle. The replica Spitfire Mk. IX will remain at Hradčanské náměstí until 2pm on Saturday 15th August. In attendance were several World War II RAF veterans: Brig. Gen. Emil Boček, Col. Pavel Vranský and Col. Emil Šneberg. Hana Fajtlová, an RAF member’s widow, was also present. The ceremony was completed with a prayer led by Cardinal Dominik Duka in St. Vitus Cathedral. Together, with hundreds of guests from political and military spheres and the general public, they stood to commemorate the 2,500 Czechoslovaks who joined the RAF in World War II. Euan Edworthy, founder and chairman of Prague PR agency, Best Communications, the originator of the Winged Lion Memorial Appeal and a general sponsor of this event, said: ‘Britain, with the free world, owe a huge tribute to the Czechoslovak airmen who fought with the RAF during the Second World War and it is a great honour to have been involved in the 70th anniversary of their homecoming. On return, they were welcomed as heroes and then, for the majority of the veterans, endured disdain, imprisonment and hardship throughout the communist period. We, and future generations to come, have a responsibility to preserve their acts of bravery in the annals of history and their role should never be forgotten’. The ceremony was organised by the international non-governmental organisation CYRIACS – the Knights of the Cross with a Red Heart and sponsored by Best Communications. The event has received wide support from both civil and military Czech organisations such as the European Military Educational and Recreational Centre Jemnice of the RAF Air Marshal Karel Janoušek; the Endowment Fund of the RAF Air Marshal Karel Janoušek; The Czech Union of Freedom Fighters; The Czech Spitfire Club; and the Air Club of General Janoušek. The ceremony was organised under the auspices of Ing. Oldřich Lomecký, Mayor of Prague 1.